Two outstanding U.S. immigrant students have been selected as winners of the 2018 Boundless American Dream Scholarship, receiving $1,500 each toward their educational goals. The Boundless American Dream Scholarship provides financial support to exceptionally promising students who fulfill the requirements of Deferred Action for Childhood Arrivals (DACA) or Temporary Protected Status (TPS) and who want to make the world a better place through technology. Students are invited to apply for the 2019 scholarship opportunity! Students with DACA or TPS are often ineligible for federal student aid programs, limiting their educational opportunities due to financial constraints. The two winners were selected from over 200 qualified applicants, based on their outstanding academic performance, demonstrated ability to overcome obstacles, and plans for the future. The stories of Hector Sanchez Perez and Jennifer Martinez Sanchez tell of two young American immigrants who defied all odds and worked diligently to earn their shot at an education that would enable them to give back to their communities. 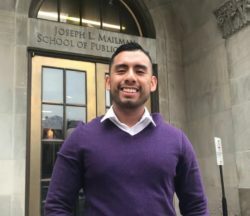 Hector Sanchez Perez is an undocumented graduate student. He plans to become a physician and will use research and medical technology to help Latino immigrants lead a healthy life, regardless of immigration status, age, or income. During the Johns Hopkins Graduate Consulting Club’s annual Biotech & Healthcare Case Competition, Hector’s team proposed building partnerships with Kaiser Permanente and 23andMe to establish a new stem-cell banking service that could be subsidized by health insurance. With this service, stem-cell banking could become a form of preventive medicine that would allow families to store stem cells to possibly treat life-threatening illnesses, such as leukemia and heart disease. Boundless is honored to offer these two students financial assistance as part of our ongoing commitment to helping all immigrants achieve their American dreams. If you will be attending college or graduate school in 2019, submit your own application today for the Boundless American Dream Scholarship. We can’t wait to hear your story!